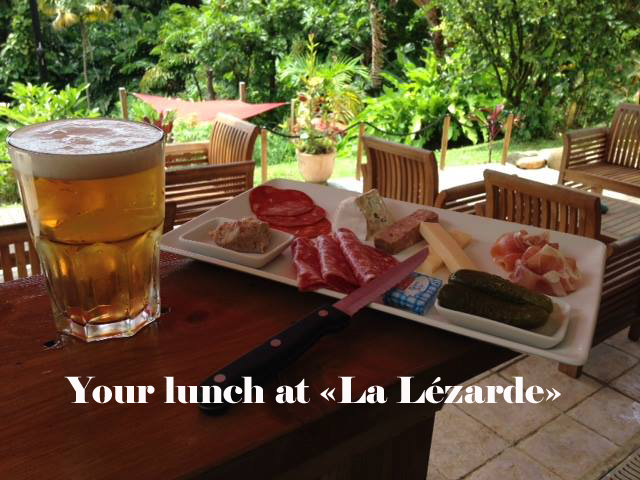 The craft brewery of La Lezarde welcomes you in Vernou , Petit- Bourg, on the banks of the river Lézarde. Come discover the manufacturing of the famous Lézarde beer. The Brewers , Gilles and Olivier will welcome you into their home, nestled in a the middle of a tropical garden and offer you an unforgettable moment of relaxation. While you're on the "Traversée" road, take a break and enjoy our beers, or a soft, over a snack, before returning to your trip in Guadeloupe. 28/06/16 : La Lézarde is on the Saint-Martin hill, in Roquefort-des-Corbières (Aude). Thank’s to Dominik Ptit-Loup ! 19/08/16 : The Lézarde is in Groix Island ! 17/08/16 : The Lézarde is at the Pointe Saint Matthieu, in Britany ! 16/08/16 : La Lézarde is in Germany, Thank’s Christelle Pfister !! Open Tuesday to Saturday from 11:30 a.m. to 7:30 p.m.